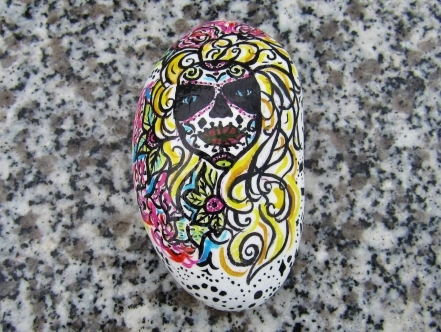 Some creative souls are painting beach pebbles for people to find. 'Keep or rehide' someone has written on the underside of the pebble above which I found under a bench looking out to sea. I decided to rehide this one for someone else to find. Fair play to the pebble painters, it is not often that you find people giving away so much time and creativity just to give strangers a bit of a treat! For more, please see our page on stones. 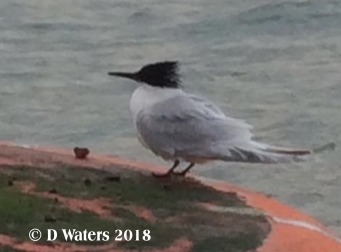 This little tern was sighted in Ilfracombe in April 2018. Distinguishable by its messy black cap and largely black beak, the sandwich tern can be seen all around the UK coast although is resident in only specific patches. It is named, not after any cheese and pickle creation, but after Sandwich in Kent where it was seen. This tern was spotted in North Devon simply sitting calmy for a lenthy period of time. As they are not resident here, perhaps it was resting as it passed through. For more, please visit our sea birds page. There are times when the weather is just too inclement (can weather be clement?) for even the hardiest of beachcombers. And I am nothing like the hardiest. So on occasion I have to take shelter. Last weekend was one such occasion. The rain poured, and the wind slapped it in my face. I decided to retreat to the nearest indoors option. Which just so happened to be a pub. Well, you what they say, any (glass of) port in a storm. But that's not the end of the beachcombing - it's amazing what you can find in seaside pubs. It's a really old-looking sawfish 'beak'. An incredible thing! 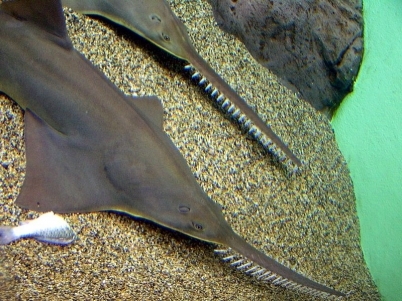 Sawfish are a type of ray which are sadly now endangered. I am likely never to find anything as large as this (other than a pallet perhaps) nor as exotic as this when I'm out beachcombing, but there it was on the wall of the pub - which makes me think we should make this search official. So who's coming pubcombing? We're half way through February and it's been as mild as May in North Devon. The snowdrops are out, but so are the daffodils, crocuses and primroses. Birds are nest-building. The grass is growing. I have even seen a few butterflies. And now the bumblebees are coming out of hibernation. 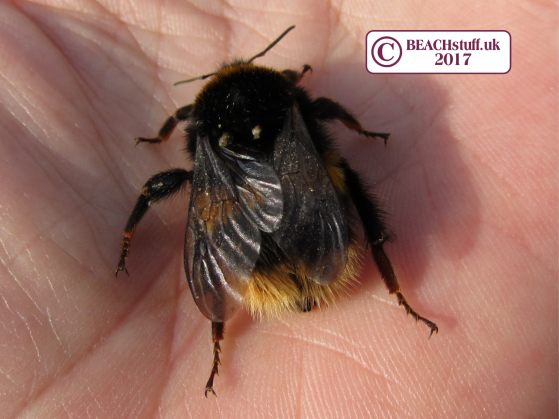 On the beach this afternoon, a queen buff-tailed bumblebee, flew onto my arm. 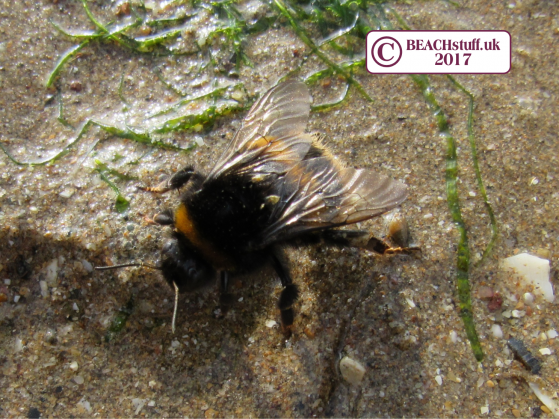 She then flew off me and onto the wet sand by my feet where she struggled to get her balance and so rolled in the wet. Queen buff-tailed bees hibernate in holes in the soil over the winter and usually emerge in March to start the process of finding herself a new nest. The first things they need is flowers so that they can take in nectar for energy. I picked our queen up from the wet sand and carried over to the dunes where are least she was warm and dry but I couldn't find it any flowers for her. 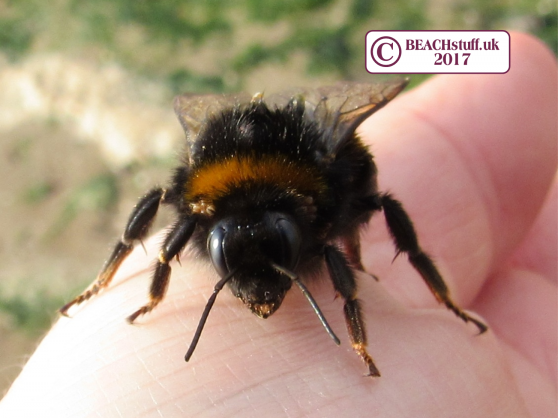 She did seem lively and well but I feared the warm sun had brought her out of hibernation before there are enough flowers on the dunes. When I left her, she was sunning herself on a concrete stump. Hopefully she could dry off a bit. And when I came back a few minutes later, she was gone. She'd no doubt flown off over the dunes - I suspect that she probably has a much better idea of where to find flowers than I do. How long does it take to collect a complete alphabet of Smartie lids? Smartie lids regularly rock up on our beaches. They are one of my favourite non-wildlife finds and I have become strangely proud of my collection of lids. I even have a couple with capital letters on - the old ones. The downside is that I can't talk about it. My friends think it is sad. And pointless. A maybe a little weird. None of this is untrue I suppose. But the delight of finding a Smartie lid on the beach is also true. 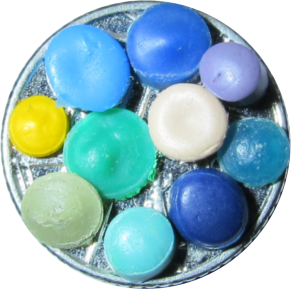 In a mess of rubbish, they are a perfectly round, brightly coloured bit of unusual joy. I've been picking them up for years and now have an enormous collection of seventeen. Ok, so it's not a vast number but look at this! Look! !I have A through to E! How fantastic! And I hadn't even realised! Before this revelation I would wander along the beach wondering what I might see. A few times a year, I was delighted to see a Smartie lid (I've done the maths - it has worked out at 4.3 times a year. But what a great 4.3 times they were!). But now those days are gone. Now I am on a mission. Now I am actively looking for Smartie lids. Searching the seaweed for that elusive F and I, and all the others on my (long) missing list. And I am disappointed when I don't find one. Will things ever be the same again? Will I ever get to Z? Only Smarties have the answer. For more on Smarties - and yes, you can actually date your Smartie lids! Have a look at this page. Yesterday I saw the messages on social media, appealing for people to get to Farewell Spit on South Island, New Zealand to help a stranded whale. As time passed, the full horror was revealed. This was not just one whale in a fight for life (which was a tragic enough story), this was hundreds of pilot whales dying on a single beach. One person sharing messages about it voiced his own frustration that he was a seven hour journey away but he shared his hope that others who were closer could do what he couldn't do. I shared his frustration that I could nothing but put my hope in others to sacrifice their own time and needs to go and help hundreds of magnificent creatures who were no longer able to save themselves. The last news I heard before I went to bed was that three hundred of these pilot whales were dead. It was terrible news but I was sadly not shocked - these strandings so often end in the worst possible way. This morning, however, the news has taken a different turn. Yes, hundreds of whales have died but there is a different story. A hundred volunteers turned up on the beach, more arrived in boats. The people took each others arms and formed a human chain which, with the support of those in boats, guided a further hundred whales out into the water. Those whales are now swmming about in the bay. It was a remarkable effort, a great testament to what people will do when nature needs them. Of course, this is not the end of the story, those whales are not (if you'll forgive the poor choice of words), out of the water yet. They are still too close to land and may yet beach again. But they have many friends there waiting to do what they can to save them again. Thank you to all those rescuers, and to all those who spread the word on social media. You not only gave a hundred whales a real chance of survival, you gave us a reason to believe in the generosity and compassion of human beings. The Mirror's coverage of the story (with some fantastic photos) is here. The BBC's story, with discussion of why strandings taken place is here. UPDATE 12th February 2017: more whales have stranded but 200 have have refloated themselves with the help of volunteers. More here. Run by FIDRA, and supported by the Marine Conservation Society and others organisations, took place in February 2017. The aim was to get people out hunting for nurdles to raise awareness of the problem and identify any nurdle trends and hot spots in the UK. There is a Sky News items about the Hunt here. The official site of the Great Nurdle Hunt is here. "More than eight million tonnes of plastic is thrown away each year and washed out to sea. It takes centuries to break down. It's eaten by marine creatures. And it's in our food chain. Your seafood supper may have a synthetic garnish. Scientists just don't know what effects it has on our health." The national press seems almost daily, to have news stories about whales being spotted in Scottish waters (an example here in the Mirror and a list of sightings can be found here). I can't tell you how envious that makes me feel down here in the South West of England! "A dead whale about 60 feet in length, and weighing many tons, has been cast up by the sea on Croyde Sands, North Devon. It had a large hole in its side which was evidently the cause of death. Many people from different parts paid a visit to Croyde on Sunday to view the find. This is the second whale within recent years which has come ashore in this locality, another huge specimen having been washed in on the sands at Saunton a few years ago." A few years earlier, the North Devon Journal (11th January 1912 p8) reported a whale stranded on Saunton Sands on Boxing Day 1911. It reported that the carcass was buried above high water in quick lime. 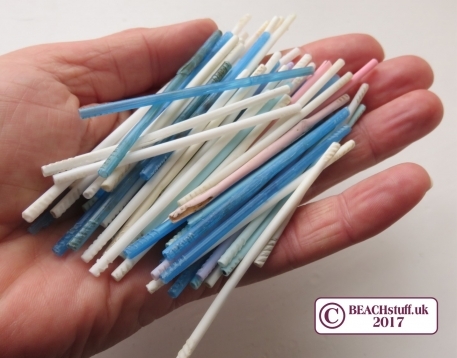 Four large supermarkets have announced that they will no longer be selling plastic cotton ear buds after next year. More details here.